Between the civil rights movement, the Vietnam War, and women’s liberation, the 1960s was a decade ripe for student activism on college campuses. Indiana University was no exception with a number of protests, demonstrations, and sit-ins being organized in Bloomington during this time period. One specific cause that garnered attention amongst students and student groups was, not surprisingly, student power on campus. One group, the New University Conference, found a rather unique way to make this issue known to those in charge. The New University Conference was a radical, leftist group made up of faculty members and graduate students. It was a national organization based in Chicago that had chapters on college campuses across the country. While it was active in the aforementioned major issues of the 1960s, one specific to this group was the need for educational reform. They had a number of ideas about how colleges and universities needed to change such as a movement away from the letter grading system to a credit/no credit system and different, less formal ways for PhD students to present their theses. Student power issues also fell into this category and in 1969 the group decided to organize an election for the position of chancellor not only to try and revolutionize the university system but also to give students a chance to make their voices heard. In 1969, John W. Snyder was named the acting chancellor of the university while a committee went about the process of selecting a more permanent replacement. While there were student representatives on this search committee, ultimately the decision was left to the Board of Trustees as they had to approve the candidate chosen by the committee. As these decisions affected student life, the New University Conference felt that students should have more of a say in the process. Thus an alternative election was organized and the group argued that any group could nominate a candidate for the position. The New University Conference had their own in mind- Staughton Lynd, a history professor with no affiliation with Indiana University. He actually had a rather rocky past with universities, and was involved with the national organization. Running on a platform of student involvement, Lynd noted that while he had ideas about what he wanted to accomplish he would not actually act without support from the student body. John Snyder was also on the ballot although he vehemently denied running whenever asked. The other two candidates were Paul Boutelle of the Young Socialist Alliance and Rev. William Dennis of the New Politics Party. While, again, this election was not considered valid (in fact newspapers often referred to it as a “mock election” or “opinion poll”), the candidates participated in interviews and organized debates. 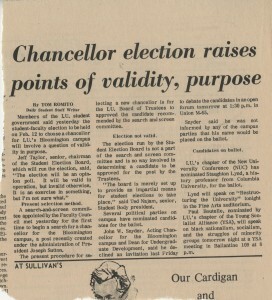 While Lynd ultimately won the student vote, he never was able to take office because the university did not recognize the election as a valid way to choose the chancellor. Despite this fact however, the exercise still made an impact. Students became more involved in both the campaign and the voting process and the university was forced to acknowledge the lack of student power in elections. 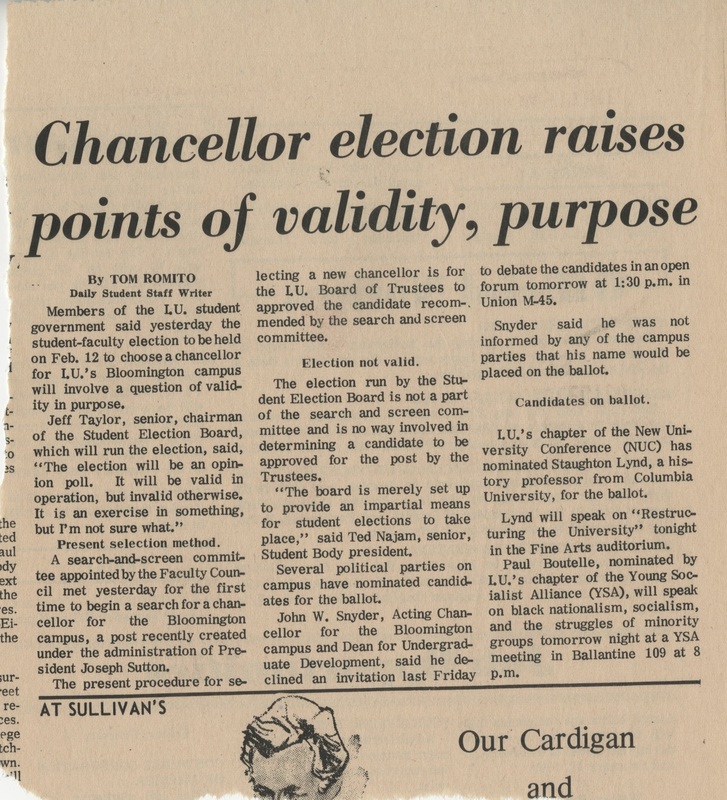 Overall, this election is just one example of student activism that occurred in a rather tumultuous period of IU history. To view the New University Conference records, contact the IU Archives. Any decent university archives will have tons of records documenting the activities of its students. However, when one looks more closely at the records, it quickly becomes apparent that most of this documentation represents an official student record, such as a transcript, an enrollment record or basic vital statistics about the student. Another characteristic of student records within most archives is that the records reflect the perspective of the IU administrators and faculty. In other words, many of the records in university archives related to student activities and culture were created by presidents, deans and directors. Consequently, these records provide a view of student life which is largely one dimensional or one sided, in that the documentation on student life is defined largely through the eyes of non-students. In an effort to address the lack of documentation on student life as documented by students, a number of university archives have initiated programs or special projects to collect the records generated by student organizations, including student government groups at all levels and fraternities and sororities. In the last five years, the IUB Archives has identified the collection of the records of student organizations as a high priority. A big part of this initiative was to actively contact student organizations about their records and to offer our services in preserving and making the records accessible. Overall the initiative has been relatively successful; we have accessioned hundreds of linear feet of records from a wide variety of student organizations. Newsletter produced by the Progressive Reform Party, a student political organization at Indiana University Bloomington. The Student Life at IU web site is a critical piece of the larger strategy to highlight student life and culture. The primary goal of the site is to depict and describe the cultural, social, and political activities of students during their time at Indiana University. In this portrayal we attempt to provide a more multi-dimensional picture of events by presenting both the “official” administrative view and response and the student perspective on the issues and events. As our first exhibit, we chose to depict the 1960s, and specifically the major demonstrations, strikes and protests at Indiana University during that tumultuous decade. To describe these events we have pulled together from the Archives a wide variety of documents representing various perspectives on the issues and events. Among these records are photos; newspaper articles; resolutions, bills and official statements created by student organizations; statements on events generated by the IUB administration; and newsletters and flyers distributed by student groups. In future exhibits on the IU Student Life site we are planning to explore the following topics: Student Life in the second half of the 19th Century; student life at IU during WWII; student life as depicted by diaries and journals created by IU students. We would love to hear from you with any suggestions for future exhibits on the IU Student Life site. In the meantime, please explore Student Demonstrations at IU! This is our last post from Heather, as she has moved on to the Kentucky Historical Society, where she serves as the Kentucky Folklife Project Archivist! Congratulations, Heather! When completing the final arrangement of Vice President and Chancellor’s records, I got a glimpse of what it was like at I.U. during the 1960s and 1970s. During this time Byrum Carter was working his way up the administrative ladder through hard work and determination. Carter was Dean of the College of Arts and Sciences from 1966-1969 and in July of 1969 following a large-scale reorganization, Carter was named Chancellor of the I.U. Bloomington campus by the Board of Trustees. During his time as Chancellor, there was great political unrest and large-scale demonstrations at I.U., as elsewhere throughout the country. Among other things I discovered, campus and nation-wide demonstration fliers, a detailed list of precautions that should be taken in preparation for demonstration and multiple signed petitions. It appears that Carter played an active role in keeping the peace on campus while still allowing students to voice their opinions in a civil manner. However, as he advanced in the academic world his roles on campus slowly changed. I was hoping to find some more information regarding the GE strike on campus, but after much time searching, I was unable to unearth any more information. If anyone was at I.U. during the Vietnam War and remembers the strike against General Electric I would love to learn more about it. To learn more about the role Chancellor Carter played at I.U., check out the collection’s finding aid and contact the Archives for access! Can a protest be polite? In my last post I discussed the controversial Dow Chemical Sit-in, which served as a catalyst for student anger against the administration. Today I have a short post about an event that, at the time, was seen as far more important than Dow recruiters being on campus. Public reaction to protesters at the two events was also markedly different, which begs the question; can one protest an event or person without violating societal decorum? 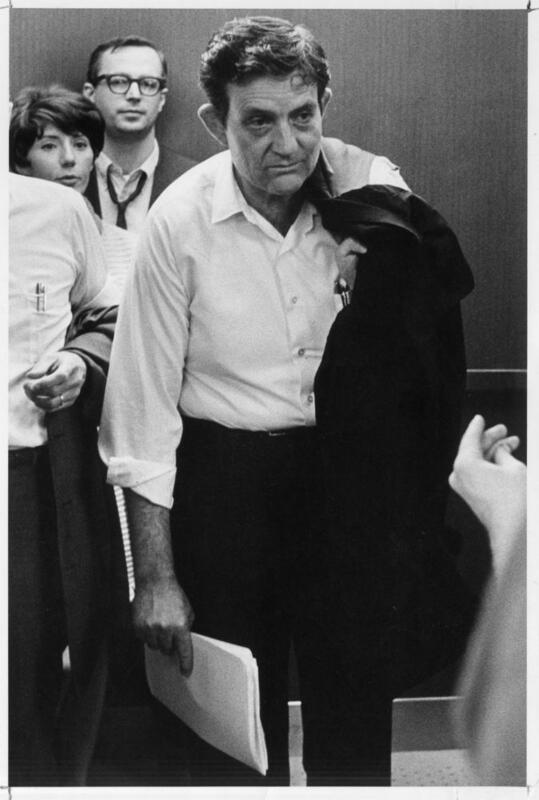 On October 31, 1967, just a day after the disastrous sit-in at the IU business school, United States Secretary of State Dean Rusk arrived on campus to give a scheduled speech. As a major shaper of President Lyndon Johnson’s Vietnam policy, Secretary Rusk was a natural target for anti-war protests on many campuses he visited. In the lead-up to his visit, leaders from a number of different left-leaning student organizations on campus worked fervently to plan an organized protest. Flyers and signs were created and handed out prior to Rusk’s speech. Outside the auditorium, demonstrators (both students and some professors) carried anti-war signs. These were met by even greater numbers of administration supporters carrying signs of their own. Inside the packed venue, around 200 protesters wore “peace” armbands and heckled Rusk with cries of “Liar!” and “Murderer!” at key points in his speech. Unlike the chaotic Dow Chemical sit-in of the day before, the protest went off without a hitch, with no physical confrontations or arrests. Public reaction to the demonstrators was decidedly negative, however, as students, professors and townspeople alike felt that the heckling during the speech had crossed a serious line of decorum. Midwestern values notwithstanding, members of the New Left would continue to use confrontational tactics in the years to come to protest against American involvement in Vietnam. Posted on August 12, 2011 August 12, 2011 by Author kstenson Posted in Categories From our collections | Tagged: Tags 1960s, Dean Rusk, interning, Student Demonstrations, student protests | Leave a comment on Can a protest be polite?